Good food, footpath dinging, and eating out in Melbourne restaurants contributes hugely to Melbournes charm  from intimate eateries, to multicultural cuisine, to world-famous-restaurant dining. A rich variety of cuisines and wide choice of restaurants have sprung out of Melbournes multi-cultural melting pot, making Melbourne a true world class city. Ranging from classic and traditional to exotic and eccentric, there is something for everyone: Charming cafes, intimate wine bars, pub meals, and up-market fine dining.
. You can eat and dine till you drop in Melbourne and still have only scratched the surface. Many fine dining venues are in the CBD, but not exclusively so. 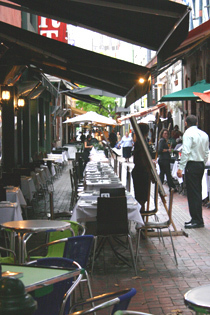 In the city and adjoining precincts you are never far from intimate eateries, cafes, as well as restaurants of any flavour and taste. We are growing a list of good restaurants in Melbourne, arranged by area as well as by type, so you can easily locate the great Melbourne food of your choice.